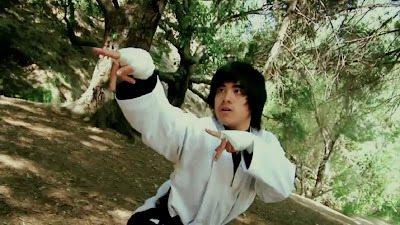 The short films of IBP Stunts Chicago seem to exist at some weird cross section of American popular culture where martial arts, anime, and westerns collide. Though Emmanuel Manzanares might not be the first to mix such seemingly disparate influences, he does so with an offbeat sensibility that demands ones attention. His latest, From Man to Man (Da Uomo a Uomo), feels like Sergio Leone by way of Wilson Yip, with a touch of Cowboy Bebop. In the first set, a ranger (Vonzell Carter) faces off against an outlaw in black teamed with another guy in a floor length duster. The second fight involves a martial artist outfitted in a gi with his hands wrapped in tape going against someone who looks like they just stepped out of a Naruto episode. Both fights begin simultaneously. The one with the ranger and the two outlaws makes use of close-ups and facial expressions, drawing much inspiration from the style of Sergio Leone. The second feels more like a low budget Chop Socky, complete with the requisite sound effects and Dutch angles. The fight choreography is as tight as a clenched fist. The synergy between the sound effects and what takes place on screen is pitch-perfect. As with Yo Soy Un Hombre Loco (I Am a Crazy Man), I’m not sure what any of this is actually supposed to be about. I’m sure there is some deep seeded subtext at play. However, I’d like to think of it as a surrealist take on Walker: Texas Ranger, sans the corniness and laughable fight choreography. I have no idea as to what the second set of opponents is supposed to symbolize. Perhaps a similar fight taking place in another mythic setting? Is Manzanares juxtaposing the iconography of the old west with that of Asia? I don’t know, but I could care less. It looks cool and maintains my interest. The work of IBP Stunts Chicago always leaves me scratching my head, but with a weird sort of grin on my face. I have no idea what I’m watching; by I manage to get caught up in it regardless. That has got to be some sort of talent. I’m dying to see a full length feature from these guys. If they can simultaneously maintain the same level of weirdness and interest for a full 90 minutes, it would be worth the price of a movie ticket or a DVD.